October is one of my favorite months. Not only is it the beginning of my baking season, but it's also when we celebrate one of my favorite holidays, Halloween. We all know this month there will be lots of candy given to our children, which means they will consume a lot of sugar, which also means cavities can form in their teeth. 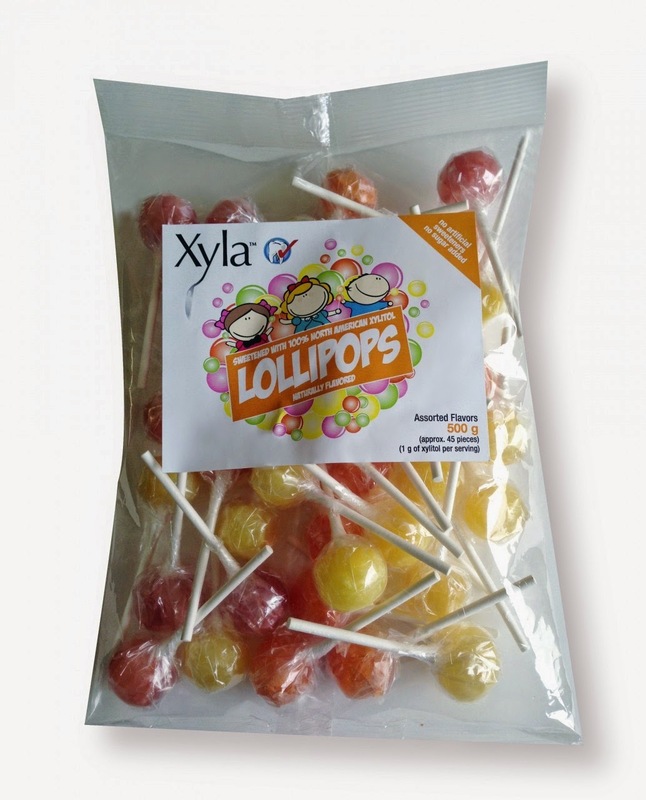 I was sent a few samples of lollipops and hard candy from Xylitol Canada, a company that provides natural sweetener products under the name Xyla, to try and substitute candy with sugar for my kids. This was a great test for me to see if they would notice if there was a difference in taste from other candy that contains sugar. I was one happy mama to know that the kids didn't taste a difference and enjoyed both lollipops and hard candies. The lollipops and hard candies are one of the most effective treats in preventing cavities for all ages and have no artificial color in them. This is pretty awesome. I have to admit I've had a few of them myself and I love them. My favorite is the grapefruit lollipop. I love these because I've been watching my weight since having the little one and like all of us, I get a sweet tooth every now and then. These are perfect to pop in your mouth when you get a sweet craving and a treat you don't have to feel guilty about. All of our samples we had in the house are gone because the kiddos ate them all up, so I know I'll definitely have to order a bag of each of them soon. This would be a great treat to hand out to those kiddos coming to your door this year for Halloween. Something the kids will love and the parents will be happy about. Disclosure: All opinions are my own. I received samples of Xyla Lollipops and Hard Candy at no cost for the purpose of this review. No other compensation was received.